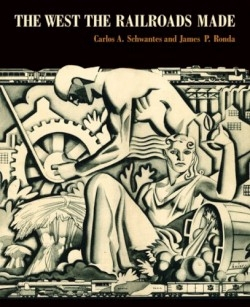 Bold entrepreneurs, big visions, daring engineering, great scenery, a huge new economy, and sweeping social change are among the elements that Carlos Schwantes and James Ronda masterfully describe in their exuberant and lavishly illustrated volume. The “Pacific railroad” was a fine, much-discussed dream, but hard reality required immense projects, armies of settlers, and endless revenue; in 1848, Asa Whitney, in stating, “I propose, by this work itself, to change the wilderness waste to cities, villages, and richly cultivated fields,” announced a hope and foretold an outcome. But, in the event, Huntington, Hop-kins, Stanford, and Crocker, whose names live on in California, were the builders. And, of course, the spread of the railroads trans-formed the West, confronting nature, adding (and occasionally removing) physical features, and also, through imaginative publications, marketing an unknown half of the American continent.